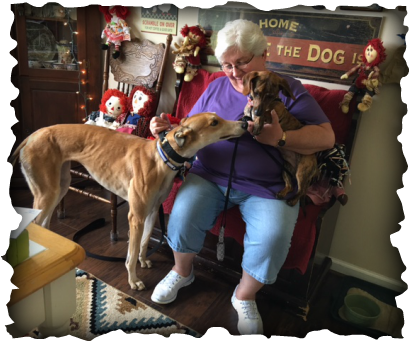 Atascocita Recee is home with Irene and Buddy in Monroe (Rosie her blind cat was not up for the family photo) Recee is starting her new life with a new name of Millie, Irene named her after watching her race video of her flying around the track just like Amelia Earhart who had a nickname of Millie! Needless to say Millie is going to have a greyt life in this loving home and soon will be good friends with Buddy. Irene's son, Kyle adopted Blazing Hanna (Skye) from GAGC at our family picnic recently! So Millie and Skye will become best girlfriends soon!